I had been using the Canon EOS 20D steadily for a couple of years when a sudden gust of wind on a ridge sent my tripod tumbling and introduced the camera and lens to the rocks of the Cascades. 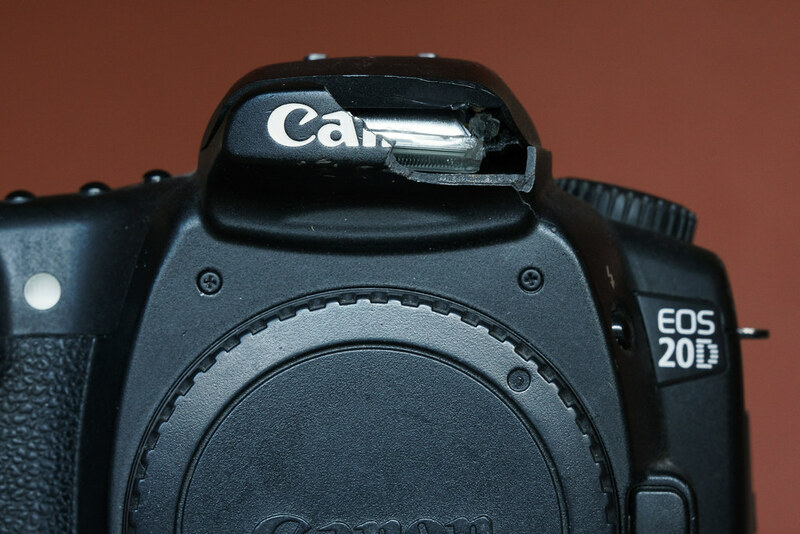 The lens was smashed to bits but fortunately the only severe damage the camera sustained was to the flash housing. I didn’t use the on-board flash so I didn’t mind its loss but the gaping hole at the top of the camera made things difficult for someone who loves to shoot in the rain, the camera wasn’t weather-sealed even in the best of times. My solution when using it in the rain was to hold a thick plastic bag on top, durable holdovers from the campus bookstore when I was in school. I still have a couple of the bags although I tend to use Tom Bihn stuff sacks to protect my equipment these days. I have a full-on camera cover but they aren’t so convenient. My low-tech solution worked, I used the camera heavily for several more years until the shutter packed it in while I was hiking with friends on Mount Rainier. I’ve hung onto the broken camera for sentimental reasons over the years, but it’s time to say goodbye as there’s no reason to take it to Arizona with us. I took it out for a quick photo session before we say goodbye. This entry was posted in Photography and tagged camera, Canon, Canon EOS 20D. Bookmark the permalink.